Atlantic City – On November 20, 1982, Main Events brought another night of championship boxing to Atlantic City’s Convention Hall. 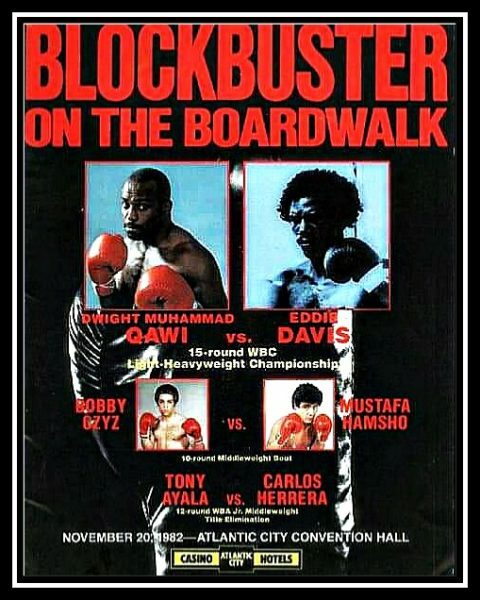 The fight card was labeled, “Blockbuster On The Boardwalk” and was headlined by the “Camden Buzzsaw,” Dwight Muhammad Qawi, 18-1-1 (11KOs), making a defense of his WBC Light heavyweight title against the challenge of reigning USBA Light heavyweight champion/WBC #2 contender, Eddie Davis, 23-2-1 (15KOs). The bout was scheduled for 15 rounds. With a unification clash looming against undefeated reigning WBA Light heavyweight champion, Michael Spinks, Qawi looked to get by Davis’ challenge to make way for that much-anticipated unification bout. After a feeling out process from both, it initially looked to be a short night for Qawi after he dropped Davis with a combination with forty seconds left in the first round. After getting up off of the canvas and answering referee Tony Perez’s questions, Davis survived Qawi’s onslaught for the remainder of the round, stumbling to his corner as the bell sounded. Had it been a lesser experienced referee, the bout could have been stopped then, but Referee Perez let the fight go on. Qawi stayed on his opponent, but the challenger wouldn’t fall, with Davis often coming back with his own noted offense. Even with a cut opened over his left eye, Davis still didn’t allow that to be a deterrent. In fact, Qawi himself began to bleed from his nose as Davis tried his best to give as much as he received. Qawi was visibly not himself, fighting at a slower pace than what fight fans were accustomed to seeing from him. Davis definitely put on a game showing in the eighth and ninth rounds, with Qawi explaining his slower performance as being a result of an earlier illness and personal problems. Even with those setbacks, this version of the “Camden Buzzsaw” was still enough to eventually stop Davis’ game effort, punishing him in the tenth and flooring him seconds into the eleventh. When Davis picked himself up off the canvas this time, referee Tony Perez examined the fighter, prompting him to call a halt to the bout after only twenty-eight seconds into the round. With Michael Spinks in attendance, tensions were in the air, but the stage was now officially set for both he and Qawi to finally meet in their WBA/WBC Light heavyweight unification. On the undercard, future AC Hall Of Famer, Bobby Czyz 20-0 (15kos), suffered the first defeat of his career, losing a 10 round unanimous decision to former middleweight title challenger, Mustafa Hamsho 34-2-2 (21kos). Also on the card was the undefeated Tony Ayala Jr. 21-0 (18kos), scoring a 3rd round KO over Carlos Herrera 47-6 (32kos).